Are you looking for a chart which will help you remember to Count the Omer, and will help you visualize where we are in the journey of the Omer? 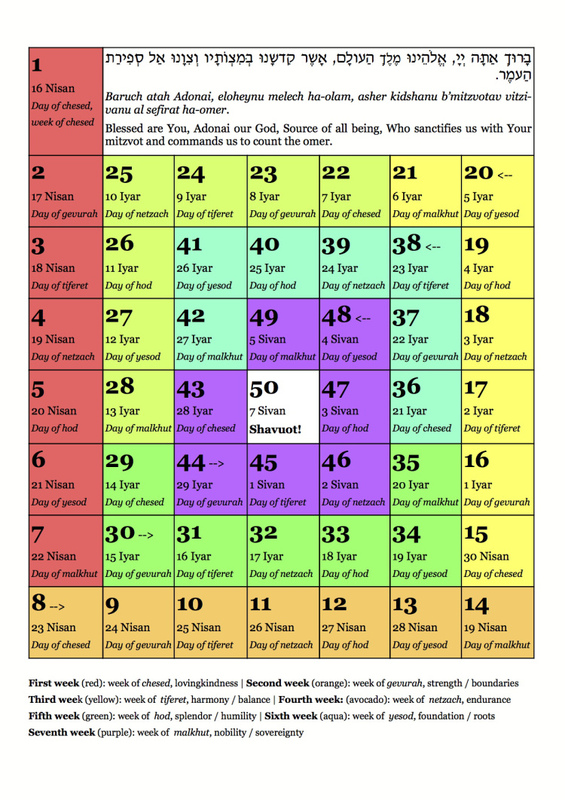 Here’s a handy Omer-counting chart, for anyone who needs one — the days spiral around, following the colors of the rainbow, until we reach Shavuot in the very middle of the page. Each week is color-coded to go with a different kabbalistic quality (lovingkindness, boundaried strength, balance, and so on) and at the bottom of the page there’s a reminder of what each of the terms means. Posted in Sefirat haOmer and tagged chart, poster, rabbi rachel barenblat, rainbow, spiral, velveteen rabbi. Bookmark the permalink.